I think we can all agree that reading uplifting stories is great. But what about writing them? Today’s guest poster, Rosey Lee, writes uplifting fiction stories with a little bit of hope, faith, and love. Continue reading to discover her motivations for doing so. Reading and writing have helped me to cope since I was a kid. Like many people, I’ve experienced anxiety, and reading books offered an escape. I spent hours engrossed in characters’ lives, and I often felt comforted, energized, and hopeful after reading a good story. Similarly, I discovered that writing felt therapeutic. I found myself working through my struggles by writing fiction stories, frequently for homework assignments. English teachers from primary school (elementary in the US) to university had a front row seat as I processed family issues, relationship drama, and whatever else I may have been dealing with at the time. I always planned to continue writing fiction, but life got busier after university. The author Toni Morrisson once said, “If there’s a book that you want to read, but it hasn’t been written yet, then you must write it.” This sentiment eventually drew me back to writing. Over the last year or so, I’ve become more serious about it. Again, it’s helped me to cope. I’ve also received a gift from writing that extends beyond myself – the opportunity to share comfort, positivity, and hope with others. My stories are intentionally uplifting. Just as I found comfort, positivity, and hope through reading, my goal is for readers to find the same in the stories I write. Rosey Lee is the pen name I use as I pursue my passion for writing. My alter ego is a physician, so health is important to me. Most of my stories have a health element, and I am guided by the World Health Organization’s (WHO) definition of health, which holistically encompasses physical, mental and social well-being. Mental and social well-being are common themes in my stories. Sometimes mental health is the main focus of the story. Sometimes it’s in the background. And sometimes my stories reflect the connection between mental and physical health. There are a few reasons I incorporate mental health issues in my stories. First, as the WHO suggests, “there is no health without mental health”. Second, writing fiction stories that have a mental health theme is one way that I can advocate for mental health promotion and help lessen the stigma around mental health issues. Third, I hope that readers are touched by the mental health themes in my stories and find comfort, positivity, and hope through my characters’ experiences. You can read a couple of my flash fiction (short) stories for free on my website. Audioversions of the stories are also posted there. Writing uplifting fiction stories has been a gateway to other unexpected benefits. I’ve become active on Twitter, where I enjoy sharing uplifting content and have begun to connect with mental health bloggers and advocates. There are pros and cons associated with social media, and it should be considered on an individual basis. I’ve also discovered the joys of Pinterest, which is particularly fun when I need a break from Twitter. I’ve created Pinterest boards for my short stories, as well as boards around hope and health. I encourage you to consider writing as an outlet. Of course, not everyone will be drawn to fiction. Perhaps nonfiction, poetry, or journaling is more aligned with your interests. It’s worth a try. You can read some of Rosey Lee’s short stories for free on her website – www.roseyleebooks.com. You can also follow her on Twitter @roseyleebooks and Pinterest www.pinterest.com/roseyleebooks. On the topic of uplifting stories, if you have one you would like to share, visit the guest posting page for all the details! 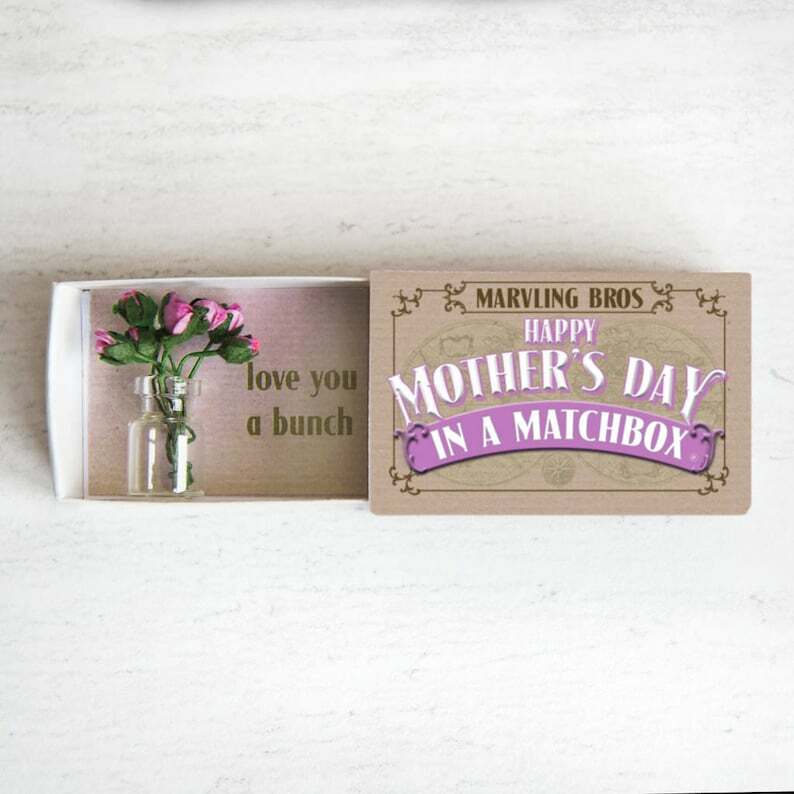 Struggling for Mother’s Day gift ideas? You’re in the right place! By now, I think I’ve established myself as an Etsy enthusiast. I shared some super cute Halloween goodies back in October and pulled together a crazy cat person gift guide as part of Blogmas. It’s one of my favourite sites, both for myself, and for gifts for others. So, you know, Mother’s Day was just another excuse to spend a few hours lost in beautiful, handmade delights. Yep, in a couple of weeks, on the 31st of March, Mother’s Day will be upon us here in the UK. There’s no excuse not to celebrate your lovely mums but I know life is hectic so I’m taking care of things for you. Don’t worry, though, I’m happy to let you take the credit with your mum. Please be aware that this page contains affiliate links, which are marked with an asterisk. At no additional cost to you, I will earn a commission if you purchase the product through my link (yay!). Am I including this because it’s tiny and I can’t resist pocket-sized goodies? Probably. 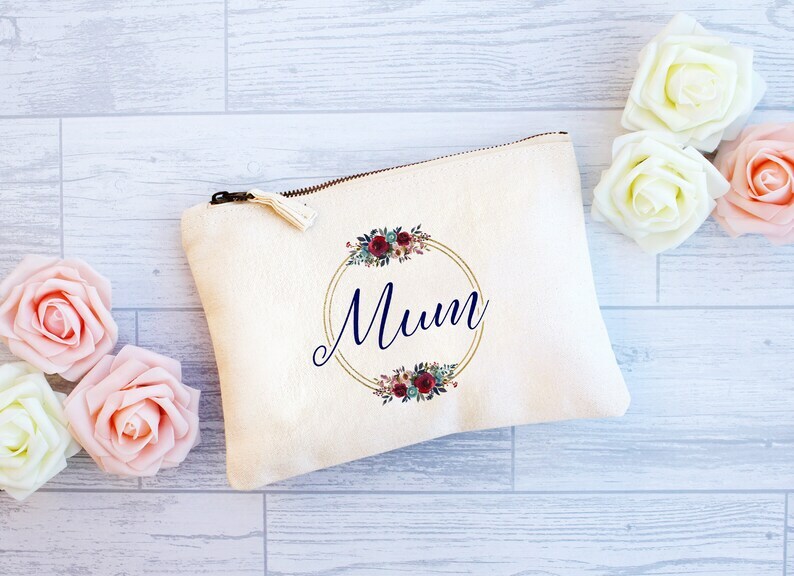 In any case, it’s a cute and unique way to show your mum some love. Inside the box is a bunch of flowers with a difference. Upon opening, your mum will reveal a miniature vase with a bunch of pink paper roses. Next to that, there are the words “love you a bunch”. It’s a loving sentiment inside an adorable keepsake! Mother’s Day gifts don’t have to cost a lot. It’s the thought that counts. I think this charming gift is proof of that! 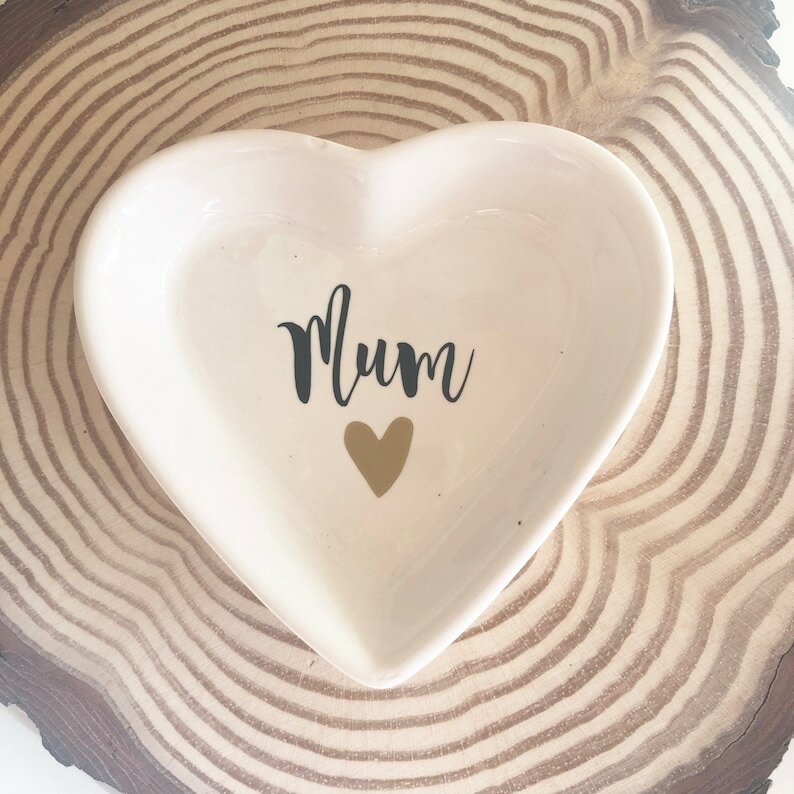 Your mum may not NEED another mug, but it’s no reason not to get her one. Especially when that mug broadcasts her appropriate title as “Best Mum Ever”. This mug has the added bonus of a Terry’s chocolate orange tucked away inside it so it’s all the more reason to get it. So simple but so pretty. This dish would be great for storing jewellery, hair grips and any other bits and bobs your mum might have. It comes in a little gift bag, too! If your mum has a sweet tooth, I’m sure she’ll be chuffed with this! It contains a floral fabric hanging heart for her to keep as well as plenty of sweeties to nibble on! Amongst them, there are Love Hearts, strawberry milkshake bottles and a pink and white nougat bar. Yum! Myself and my siblings affectionately refer to my mum as “mama bear” and I couldn’t resist including this. It’s SO CUTE! It doesn’t say mama bear anywhere on it, though, so you could just as easily gift it to someone else (like your grandma) if you wanted to. 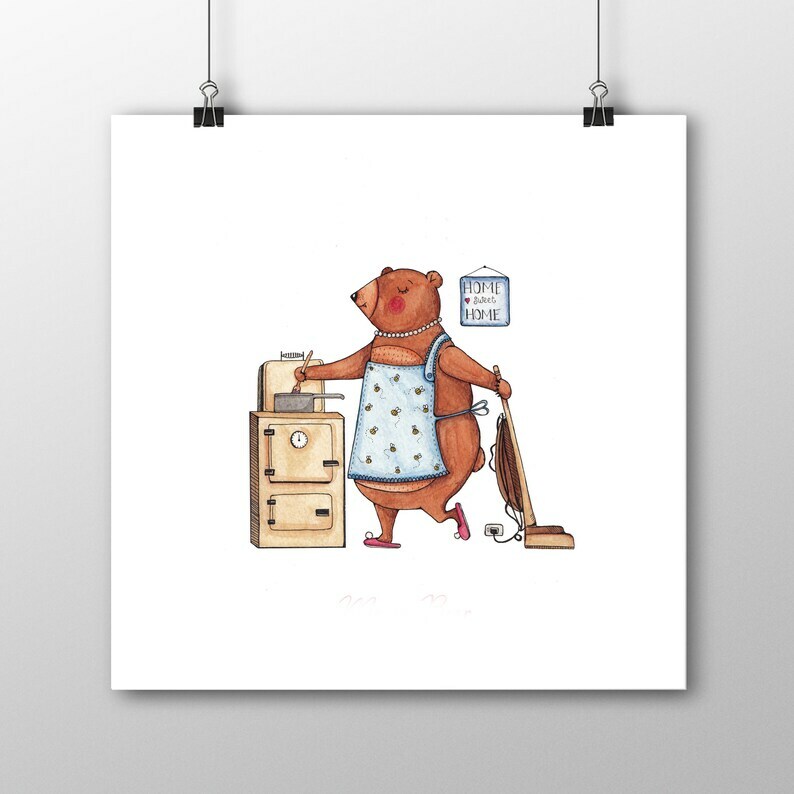 Celebrate all of your mum’s favourite things with this print. Whether she loves George Clooney, shopping or coffee, you can list them all here. Maybe sneak a compliment or two in there as well. The A4 size is a little bit extra at £14.00. I think this is so elegant! Your mum can store all of her makeup essentials in here to keep them handy. 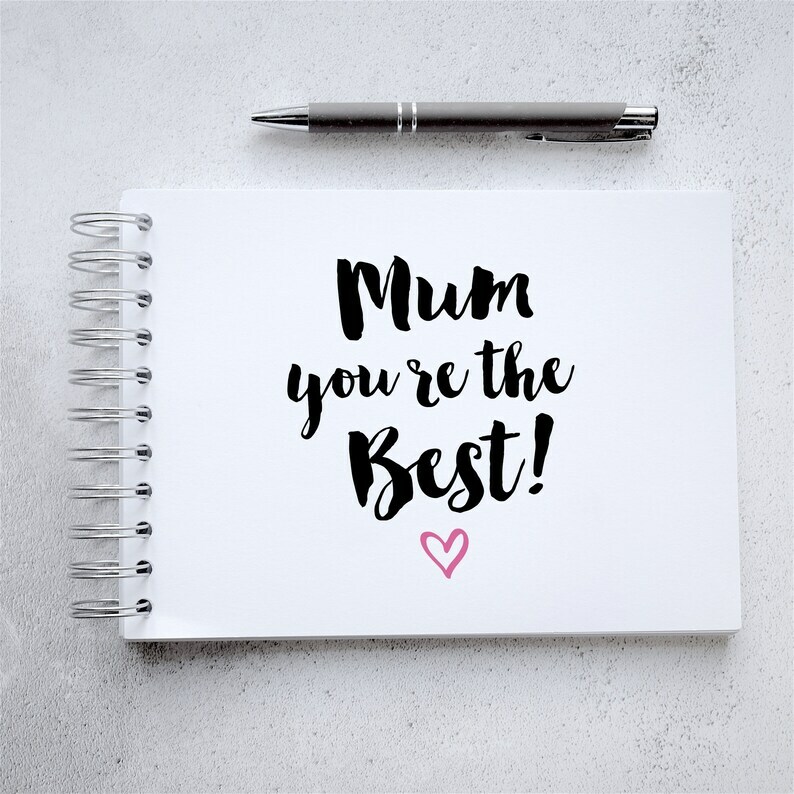 There are two given options – Mum or Mom – but you can select “other” and add another name in the notes when you make your purchase. If, like me, you are unfortunate to have many miles between you and your mum, this could be a good gift to choose. The label on the front of the candle says: “Mum, even though we are miles apart, you are always in my heart.” So, as long as she has the candle, she has a reminder that you’re thinking of her, no matter the distance. You have the choice of several scents, too, such as cranberry delight and luscious vanilla! I feel like it’s impossible to get mums to look after themselves! They’re usually so busy taking care of everyone else. This is a sweet way to give them a nudge in the right direction. It includes scented foot cream, bath fizzers, cosy pink socks, scented candle and some chocolates. Everything she needs for a little pamper session! This made me chuckle, and I imagine it would bring a smile to your mum’s face, too. It also reminds me of any time I’ve tried to convince my mum that I’m her favourite. She usually has a response like “you’re my favourite youngest child.” Smart move, Mum. If you fancy being a bit more creative, a scrapbook would be an appropriate choice. Fill it with pictures, messages and memories. I’d recommend keeping a few pages spare, though – for any happy times that lie ahead. This starts at £15, but you can choose the size and how many pages you have, and the price will adjust accordingly. It can be personalised with a message on the back cover, too! How about a gift that keeps on giving all year round? This box has 52 cards – one for each week of the year. I feel like there are two options with this one. Firstly, you could give it to her with the blank cards and then fill them with the memories you make throughout the year. This works if you currently spent lots of time with your mum but also as an incentive to make more effort if you don’t. OR you could write a message/memory on each card and then she can read one every week throughout the year. Again, this might be a good option if you live far away from each other. That is, of course, if you trust her not to peek at them all. I hope you’ve found something suitable on this list or are at least brimming with inspiration! If not, there are a whole bunch of additional ideas in Etsy’s Mother’s Day section*. We all want to be good enough. But for who? And what does it mean to be “good enough”? The thought I’m referring to came to me in the middle of my self care afternoon. It caught me off guard because my self care sessions are, ideally, a time when I don’t think about anything at all. Yet, there I was, cup of tea in hand, Netflix on the TV and one deep thought popping up to say hello. During the course of my life, I have put a lot of energy into disliking myself. More than anybody knows, and more than I even care to admit. It really does seem like such a waste. I could have used that time and effort for so many other things. Now, just because I have realised this doesn’t mean I’ve suddenly made the switch to loving myself, but it did feel good to recognise that it’s a pointless pattern of behaviour. It’s not exactly new information. My counsellor pointed this out to me – several times, in fact – but I think some things sit in our heads until we are ready for them. She told me that it wasn’t achieving anything. I heard her, but I didn’t process it. It stayed in there, somewhere, ready to resurface. What Does It Even Mean To Be “Good Enough”? That one thought has since spiralled into a whole bunch of others, which is why I’m writing about it. Like, at what stage would I think I was “good enough”? What would make anyone “good enough”? I don’t know if I would ever consider myself to be “good enough”. With that in mind, is it even worth the energy trying to pursue it? Maybe I need to learn to accept myself as I am, right now, and view anything else as a bonus. Not a single one of those things makes me a bad person. I’m not a bad person and I KNOW that. I have done things I’m not proud of. I have made mistakes along the way, but I have a good heart. When I do something wrong, I try to learn from it. Every day, I try my best. I don’t go out of my way to make others feel bad. Quite the opposite, in fact. I do what I can to make other people happy. I am loving, caring, thoughtful and generous. In reality, I have a lot of qualities I should be proud of, but, for some reason, I’d rather analyse the bad bits under the microscope. I don’t love my body, but it’s the only one I’ve got. It makes magical things happen. My eyes have seen beautiful sunsets. I have fingers to type. My arms held my nieces when they were born. My legs take me places. All in all, my body, regardless of how it looks, is doing a good job. Who Are We Trying To Be “Good Enough” For? At some stage in my life, I wanted to be “good enough” for boys. Maybe just my peers in general, actually. I wanted to be skinny enough and pretty enough and cool enough so that they would like me. Personally, I don’t think that’s unusual. I really thought I’d grow out of it, though, to tell you the truth. Yet, now, here I am, with a man who loves me completely, and I’m still fixated on this idea of being “good enough”. I am enough for him as I am (which is what I should have always been aiming for but it doesn’t seem so straightforward when you’re a teenager!). He loves me whether I’m happy, sad, gobbling a pizza, singing out of tune or taking up all the space in the bed. He doesn’t care what the scales say. I can act like an idiot around him and it makes absolutely no difference. He loves me unconditionally, and it’s wonderful. I was good enough for my parents from the second I was born, because I was theirs. They have never done anything to make me think otherwise. My siblings have always supported me. I am good enough for them because we are family. That’s all that matters. When it comes to friends, I don’t have many, but the ones I have build me up. They don’t try to change me. They are my friends because they like me as I am. These are the people who matter, and I am enough for them. If I was different, would I even be fortunate enough to have these people in my life? There have definitely been people who have made me feel otherwise. I have had some awful things said to me, but how long can I allow that to shape the person I am today? Most of it was so long ago now, yet I’m still allowing it to linger. Besides, of everyone I’ve ever met, do you know who has been the most unkind about me? I’m always so hard on myself. And I’m tired. I mean, jeez, if someone else said the things to me that I say to myself, they certainly wouldn’t be allowed to stick around in my life. I am so fixated on the idea that I could be better. I’m a perfectionist. I’ve put myself on an impossible path here. I’m stretching out for something I will never reach. Nobody will. I know there will always be something else that I feel I’m not doing quite right. Some things, I could change, and maybe I will. But I’ve got to let this pressure go. There’s a John Mayer lyric (isn’t there always?) which is “what about this feeling that I’m never good enough? Will it wash out in the water, or is it always in the blood?” I think about it a lot. I can’t say if I’ll ever be comfortable in my own skin. There’s a long way to go before the inner torment ends. But, I would like to think that day will come, and I am one step closer. Right now, in this moment, you are enough. I want you, if you can, to give yourself permission to accept that. And if you can’t, then ask yourself the above questions. If you were “good enough”, what would that look like, and who would it be for? Don’t chase “good enough”. Just be good and let that be enough. Somewhere in the future, you may try to change things about yourself. That’s a choice you have every right to make. But I hope you make it because you know it will improve something which is already wonderful. I hope you can embrace yourself as you are because, until you learn to do that, I don’t know if you’ll ever be “enough” for yourself. You will continue chasing and trying and pursuing and it won’t matter. Until you stand up and say “I’m enough”, you are always going to be searching for better. One day, we are all going to die. It’s not a nice thought. I actually have a very intense phobia of death and dying so I do my best not to think about it. But I think your life begins the moment you realise it will end. That we don’t have an unlimited amount of time. We just have the here and now. We must use that time wisely. And, I don’t about you, but I can think of a whole load of things that are more fun than picking out our flaws and setting impossible standards. It won’t be easy, but let’s try to just get on with living. Celebrating who we are, in all our flawed, odd, imperfect glory. Filling our heads, hearts and lives with good stuff. Anything else is just a waste of time. There’s no excuse needed to celebrate inspiring women but, seen as though Friday is International Women’s Day, we’ve got one. Lea is a software engineer from Texas. That’s a fact I love in itself. But in her spare time, she works on her blog, Women of Silicon Valley, which she launched to celebrate the ladies in tech. Women celebrating women is always something I can get behind! The blog has a similar format to Humans of New York, as it is generally a picture with an anecdote. Lea has featured all sorts of badass women, including employees of Google and Linkedin. In the earliest years of her life, Maria witnessed domestic violence within her family. She grew up believing she wouldn’t accept such behaviour, if she ever found herself in the same situation. Sadly, that’s exactly what happened. For eight years, Maria suffered at the hands of her husband. She eventually decided to leave for the safety of her children. It takes a lot of strength to walk away from that. While that alone is admirable, how she has used her experiences is commendable. Maria has become a “Positive Champion” and helps others in Moldova to break free from domestic abuse. She uses her story to show other victims that it is possible to remove yourself from that awful situation. The Australian comedian is openly lesbian and does a lot of work supporting charities. She has also been diagnosed with autism and ADHD. Neither her sexuality or her diagnosis get in her way, and that’s how it should be. Beyond that, I won’t say much about the routine because you need to watch it to appreciate it. I don’t think it’s giving too much away to say that I hadn’t seen anything like it. It shocked, moved and entertained me in so many ways. There was a palpable sense of strength and resilience from Hannah and it was fantastic. Peggy Whitson is a former astronaut. Prior to her retirement in June 2018, she was doing all sorts of awesome stuff. During her career with NASA, she spent a total of 665 days in space, which is more time than any other American astronaut – male or female! As if that wasn’t cool enough, at the age of 57, she was the oldest female astronaut in space. I hope I’m that awesome at 57. Maybe not because I’ve been to space but something equally brag-worthy. I discovered Emily after my mum bought me one of her calendars for Christmas. Having followed her on Instagram and done a little bit of research since then, she’s become someone I really admire. We both have similar ambitions with what we do, in that we both just want to spread a bit more happiness. And let me say, Emily is nailing it. In 2015, she launched The Happy Newspaper which is full of only the good stuff that’s happening in the world. Goodness knows, we need it. She now has a delightfully colourful range of greeting cards and stationery which can be found in stores such as John Lewis. If you want more feel-good vibes in your feed, check her out on Instagram. While you may know her from presenting T4 or have seen her in The Good Place on Netflix, it’s her activism off-screen which has caught my attention. She regularly uses her social media platforms to protest against airbrushing, steer people away from diet pills and encourage others to celebrate qualities beyond their appearance. In March 2018, she launched the Instagram account, I Weigh, which accepts non-edited selfie submissions from followers. Rather than focusing on physical features, they are instructed to celebrate things they are grateful for or proud of. It’s a wonderful initiative and a clear demonstration of a celebrity using their influence for better. In September 2014, Nadia was captured by ISIS. She was held as a slave for three months, during which time she was beaten and also raped. She managed to escape when one of the captors left a door unlocked. Following her escape, she shared her story and worked tirelessly to help others like her. Though she has admitted having difficulty opening up about her story, she recognises its importance. Last year, in 2018, she was the recipient of the Nobel Peace Prize for her efforts to end the use of sexual abuse as a weapon. Hayley Williams is the lead singer of Paramore. While her amazing songwriting, powerful voice and enviable style are all worth mentioning, there are a few others reasons why she’s on this list. Firstly, she has been very open about her mental health struggles. She has freely discussed attending therapy and the benefits that has had for her, and there have been numerous occasions on Twitter when she has urged her followers to seek help if they need it. As well as that, she now has her own hair dye company, Good Dye Young. The hair dyes are vegan, cruelty-free and available in some truly stunning colours. So, now, not only does she rock the stage, but she’s nailing business, too. Finally, I think she’s a great role model for young girls. She doesn’t fit into a box – she’s boyish and girly, strong and sweet, pretty and powerful. For me, she highlights how girls can be whatever they want and there’s no need to get caught up in gender stereotypes. Wear what you want. Be what you want. I imagine you are already well aware of Ellen DeGeneres. It just didn’t feel right not to have her on this list. When Ellen came out as a lesbian, it could have ruined her career. It was uncommon for celebrities to be so open about it at the time. Luckily (for her and the rest of us), it didn’t hold her back. She’s proceeded to do lots of inspiring things such as raise millions for charity and touch lives all over the world. I think what I admire most about Ellen is her compassion, and how it never fails to shine through. She cares, and you can see that in her eyes. She wears her heart on her sleeve and seems like such a special lady. I wholeheartedly believe the world needs more people like her. If you want to read about more inspiring women, take a look at the Women Empowerment tag I participated in! Who would you add to this list of inspiring women and why? Reading books about mental health can be a great way to gain a new perspective, either of your own situation, or someone else’s. Even before my own diagnosis, I loved reading them. I find them fascinating and since being diagnosed with anxiety and depression, my love for them has only grown. As of this year, The Perks of Being a Wallflower is 20 years old! I can’t believe it. Anyway, that’s not the point but I had to have a moment. It is a coming-of-age book which tackles a range of issues, including drugs, sexuality and mental health. Though this is primarily a work of fiction, it did stem from the author’s own struggles. The story is told through Charlie’s letters to an unknown friend. It follows Charlie as he navigates life as an introvert while also dealing with the aftermath of two traumatic experiences. The books documents his growth and the relationships he forms along the way. Other characters in the book are dealing with their own difficulties, too. Through these individuals, Stephen Chbosky explores more complex issues, such as childhood abuse and domestic violence. With that in mind, there may be aspects of this book which are triggering for some, so I would like advise being cautious before you dive in. I don’t want to say too much about it, but I think Charlie is a very relatable character for individuals who are introverts, deep thinkers and/or struggling with their mental health. This is my all time favourite book. Charlie is the character I relate to the most in anything. Though I haven’t dealt with some of the experiences he has, our personalities are closely aligned. At the age of 24, Matt Haig went through a serious depressive episode. His book, Reasons to Stay Alive, shares his journey to recovery. Matt writes honestly about mental illness, but with an air of optimism. For me, he strikes the perfect balance between emotional and uplifting. One of the strengths, for me, is that this is written by a male. It can often be harder for men to talk about mental illness, so Matt’s openness sets a wonderful example. Other books in this list have male characters, but I think a non-fiction work by a male is particularly beneficial. I wholeheartedly recommend this book to anyone who is having a difficult time. I recognised myself in so many parts of the book and I have mentioned before that this was the catalyst that led to my diagnosis. Yep, Matt Haig is securing another place on this list. He’s just that good. Notes on a Nervous Planet holds a magnifying glass to the world we live in and the impact it’s having on our mental health. With constant connection, news at our fingertips and work only an email away, is it any wonder so many of us are feeling overwhelmed? It is both compelling and calming. Whether you have a mental illness or not, I have no doubt that you will recognise some of your own thoughts and behaviours in this one. As Matt says himself, it is a global issue. This follows the story of Craig Gilner. He becomes overwhelmed by the pressures of attending a prestigious school, despite having worked hard to get there. This manifests as an eating disorder, disrupted sleep patterns and suicidal thoughts. He is given a prescription for Zoloft. As the medication takes effect, he thinks his problems are solved and stops taking it. Unfortunately, this means his depression resurfaces. He calls a suicide hotline and is admitted to a psychiatric unit. Upon his arrival, Craig is shocked by the place. He doesn’t feel like he should be there. Nevertheless, he stays to receive treatment. He confronts the causes of his anxiety and begins his journey to recovery. During this process, Craig discovers a natural talent for art. He identifies that this is something he enjoys, and his counsellor suggests he transfers to an art school. In my opinion, this book has several strengths. The first of these is that it highlights how there can be a lot of academic pressure on students – a topic I have discussed previously in Are Smart Children More Prone to Depression as Adults?. Secondly, I think it shows how dangerous it can be to just stop taking anti-depressants. It is common for people to fall into the trap of thinking they no longer need their meds when they are, in fact, the reason they feel okay again. Finally, I think it gives a subtle nod to how creatives can feel trapped in traditional routes. Similarly to The Perks of Being a Wallflower, this is a fictional book, but it is based heavily on the author’s experiences. Ned Vizzini was in an adult psychiatric unit in 2004, which served as the inspiration for this book. Heartbreakingly, in 2013, Ned Vizzini took his own life. I know this has received a lot of hype, but I believe it is justified. I read this shortly before it really took off and was EVERYWHERE, which may have helped me appreciate it more. It’s understandable that highly acclaimed books, films and albums can often be disappointing. That said, I think Gail Honeyman draws attention to the fact we don’t always realise when we’re in a dark place – particularly if it’s all we’ve known for a long time. In Eleanor’s opinion, she’s fine. Despite the fact most of her existence is spent in isolation, she sees no issue with this and seems content in her own company. However, as you read through the book, details emerge of a troubling past. Eleanor feels very real and relatable. She is someone any of us could be, or could know. I think this book definitely draws attention to the fact we sometimes need to look a little deeper. Both at the people around us, and at ourselves. Not everything is as it seems on the surface. I follow Fiona on Instagram, where she often uses her stories to discuss how she’s feeling that day as well as other mental health issues. She is someone I respect a great deal. Her book is all very familiar to me, as my own story with mental illness mimics hers. Though there are differences in some of the details, the overarching theme is the same: that depression can swoop in and knock you off your feet, but that recovery is possible. Much like myself, Fiona has been able to connect with several important people due to her online presence. Blogging has been hugely significant in my journey, and it was wonderful to read a similar story. Fiona’s writing is a joy to read. She is honest and engaging. I think she gives invaluable insight into what it’s like to be caught in the transition between an analogue world and a digital one. She addresses both the positives and the negatives of social media in a way that so many of us would relate to. Though I think this would be suitable for anybody with, or interested in, mental illness, I think it’s an especially good read for bloggers. What are your favourite books about mental health?